We can see a man dressed in white, with a striped shawl. 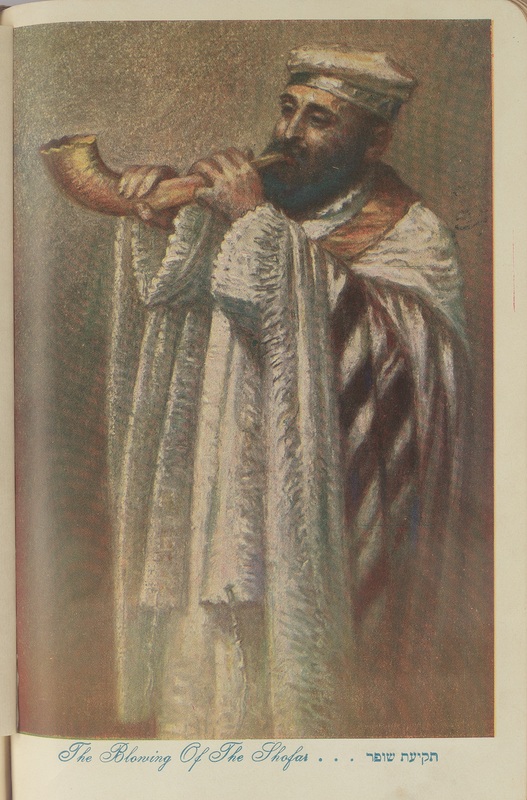 He is blowing a horn. 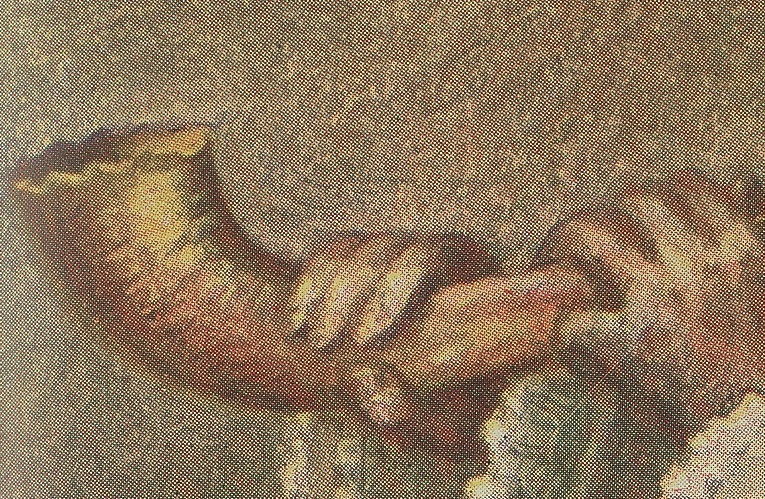 The is a colour illustration of a Rabbi blowing the Shofar on Rosh Hashanah. 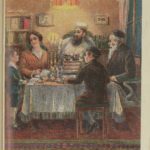 The festival of Rosh Hashanah—the name means “Head of the Year”—is observed for two days beginning on 1 Tishrei, the first day of the Jewish year. It is the anniversary of the creation of Adam and Eve, the first man and woman, and their first actions toward the realization of mankind’s role in G‑d’s world. 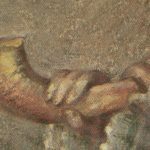 The central observance of Rosh Hashanah is the sounding of the shofar, the ram’s horn. This sound resembles the trumpet blast of a people’s coronation of their king. 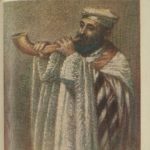 The cry of the shofar also represents a call to repentance as Rosh Hashanah is also the anniversary of man’s first sin and his repentance and serves as the first of the “Ten Days of Repentance” which culminate in Yom Kippur, the Day of Atonement. 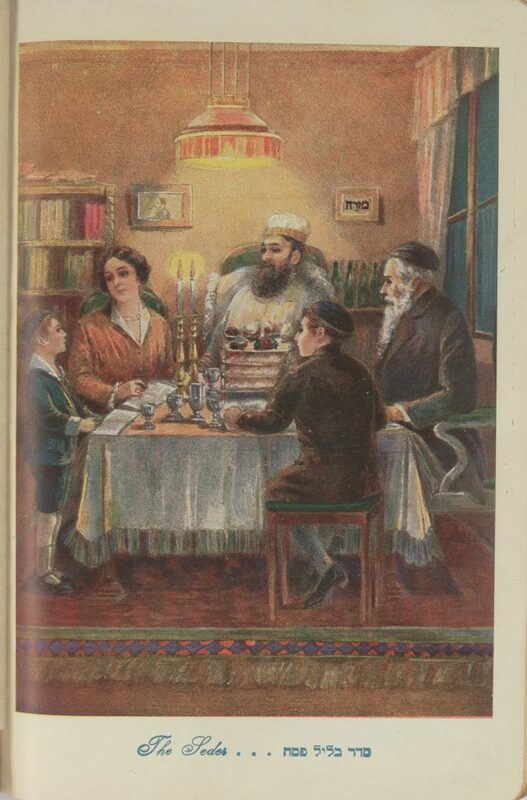 Yom Kippur is celebrated ten days after Rosh Hashanah. Yom Kippur is considered the holiest day on the Jewish calendar and refers to the annual Jewish observance of fasting, prayer and repentance. Traditionally, many Jews wear white on Yom Kippur. Because white is a symbol of purity and Yom Kippur is a day when we undertake a spiritual cleansing, it is an appropriate color for the occasion. We might wonder what the Hebrew writing says at the bottom of the page. We might also wonder who this Rabbi is. This illustration is taken from ‘Schaare Tephillah’ (Gates of Prayer) Daily Prayer Book, in a revised translation by Reverend Abrahamsons, with colour ‘illustrations by famous artists’, published in Vienna.